There are many reasons for investors to be nervous. President Trump threatened to impose tariffs on all Chinese imports and then attacked the Federal Reserve for hiking interest rates. At the same time, stocks are trading at valuations that haven’t been seen since the 2008 financial crisis and dotcom boom. Next week, traders will be keeping a close eye on existing home sales on July 23, new home sales on July 25 and GDP data on July 27. The market will also be paying attention to President Trump’s actions and any indications that the Federal Reserve will slow its interest rate policy. The SPDR S&P 500 ETF (SPY) broke out from trendline resistance at around $278.00 before giving up some ground by the end of the week. 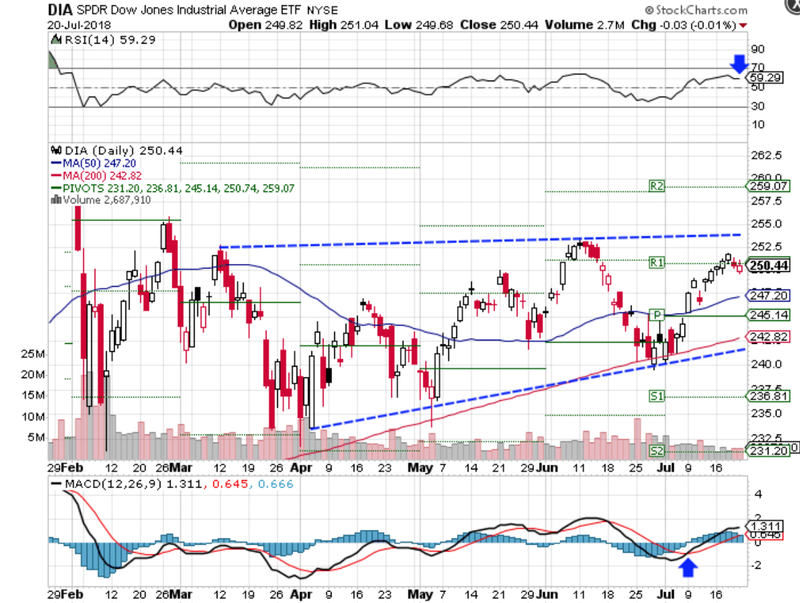 Traders should watch for a breakout to retest upper trendline and R2 resistance at $282.41 or a breakdown below trendline support to the 50-day moving average at $274.29 or lower trendline and pivot point support at $272.67. Looking at technical indicators, the relative strength index (RSI) appears neutral at 60.92, but the moving average convergence divergence (MACD) remains in a bullish uptrend. 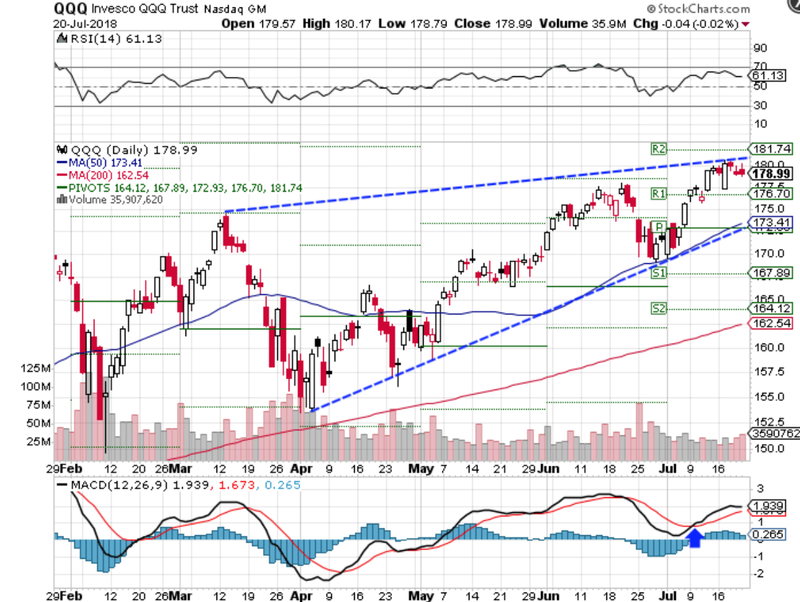 The Invesco QQQ Trust ETF (QQQ) broke out from R1 resistance at $176.70, past its prior highs made in June and to upper trendline resistance. Traders should watch for a breakout to R2 resistance at around $181.74 or a move lower below R1 support to lower trendline, 50-day moving average and pivot point support at around $173.00. 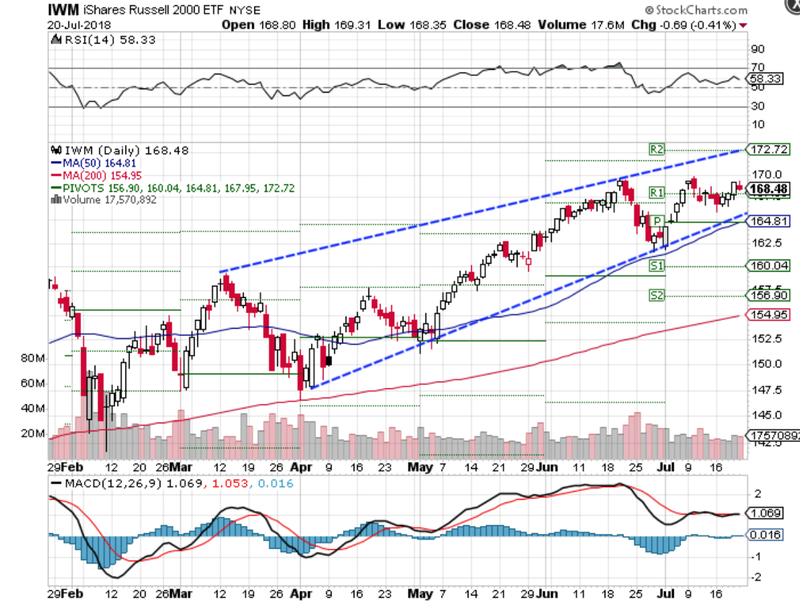 Looking at technical indicators, the RSI appears neutral at 61.13, but the MACD remains in a bullish uptrend. Charts courtesy of StockCharts.com. Author holds no position in the stock(s) mentioned except through passively managed index funds.